This would be the time, I thought. If it ever was possible to catch a station from the South Pacific, today Friday, November 13th 1998, the conditions seemed ideal. The steady flow of Alaskan and Hawaii stations indicated that the path over the North Pole was open. Russian Far East stations on shortwave were unusually strong. I began browsing through selected frequencies until a weak signal on 1017 kHz caught my attention. Mediumwave stations from the Pacific have always been among the most valued targets for Finnish DXers. 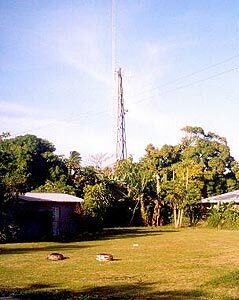 My first 18 years of DXing had netted me 16 verified stations from Hawaii and 3 from Australia - until the dawn of November 13th 1998. The last full day of the DXpedition LEM121 began with below average conditions to North America during the night. Sunrise in Lapland was typically the best time to receive stations from the Western hemisphere, and on this lucky Friday I was able to identify a couple of U.S. stations including KTOP on 1490 kHz. I also logged some nice Europeans, such as Sud Radio on 819 kHz and RNE Monforte de Lemos with regional programming for Galicia on 972 kHz. But as conditions soon deteriorated, I resorted to shortwave DXing, and ended up recording the closing of the regional Tikhy Okean program from Khabarovsk on 7210 kHz. Incidentally, the name of the program means Pacific Ocean. At 0900 UTC Tikhy Okean was replaced by the national Vesti newscast and it was time to move on. The AM band was mostly quiet, hardly anything from the Western hemisphere. Still, roughly 15 Alaskan stations were audible, as well as several Hawaii stations. This was unusually many stations from there, but still I found nothing new for me. I also noticed that not only Khabarovsk, but other Russian Far East shortwave stations were coming louder than on any previous day. All of this had one common feature; the direction of the signals, as they were coming over the North Pole, a difficult route, which is very often silenced by magnetic disturbance. The day was exceptional also in that sense; in just one day, the A-index shot up from just 1 to a staggering 44. All of this led me to try the impossible - hunt other, more distant AM stations from the Pacific. I wandered through the AM band, which on 9-kiloherz intervals only seemed to offer some weak European stations. I checked the WRTH for potential South Pacific frequencies until on 1017 kHz I heard music which immediately gave me the shivers in a positive sense. These kind of songs I had previously heard on the provincial shortwave stations of Papua New Guinea! I quick check with the WRTH revealed no PNG here, but Tonga instead. It was 0935 UTC. I alerted my fellow listener Jim Solatie. Both of us were still more or less in disbelief, but Jim began to look for other stations in the area, while I began recording the weak signal, which occasionally became totally inaudible but regained power even after a long absence. I thought of other possibilities, including Taiwan, which had fooled me to follow its programming for quite some time during an earlier DXpedition, but none of the other stations listed on the frequency fitted to what I heard. The language of the female announcer on the air reminded me of Pidgin. As I later learned, the language was Tongan, not really related but with some common features. I recognized a few English words, but other than that the talk was total gibberish to me. At 0945 the music program gave way to a talk program, which I initially thought would have been some type of news or current affairs program. 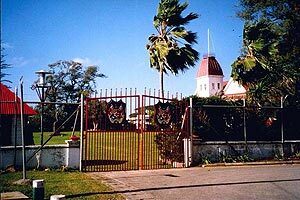 As I learned much later from a telephone conversation with the Tonga Broadcasting Commission, it was actually personal messages connecting people living on different islands, very much like the well-known comunicados of the Andean stations in South America. I was later told that the messages were read by former chief announcer Ms. Mele Heimuli, who retired in 1999. This continued over the top of the hour without any recognizable station identification. Music programming resumed, again of the type I had learned to expect from Pacific stations. The signal was more or less audible until around 1030 UTC, after which it no longer surfaced. Most of the time I used two receivers and two tape recorders, just in case. The signal was best audible with my 800-meter-long Far-East antenna pointed at about 45 degrees. The antenna straight north to Alaska gave an even weaker signal, other antennae were totally useless. I was still in doubt; much seemed to support my theory of Tonga, but with no station identification, I didn't have much concrete evidence to brag about. However, I had enough recordings for a tentative reception report, which I sent as soon as I returned back home from Lapland. Meanwhile, Jim had no luck. Some stations in the area had obviously already signed off, and others were just not audible. But somewhat later in the day, after 1245 UTC, I caught KTWG from Guam on 801 kHz, quite a rare catch, and another indication of the very unusual reception conditions favoring the Pacific that day. Also some Japanese and Philippino stations were identified, but nothing really sensational. My first reception report sent in express mail probably got lost on the way to Tonga. Unlike the other major catch of the day, KTWG, which sent a QSL-card along with a kind letter confirming my reception of their program titled Turning Point. The turning point of my QSL-hunt was however still to come. I became anxious, not knowing if I really had nailed Tonga or not. I sent a tape to a fellow DXer Paul Ormandy in New Zealand who tried to get some sense of the tape by contacting Tongan-speaking people. No luck. In March 1999 I sent a follow-up report and later an inquiry by telefax. This finally prompted Chief Engineer Sioeli Maka Tohi to send his kind confirmation letter by telefax. Later by mail I also received their traditional QSL card featuring call-letters A3Z. The distance from Lapland to Tonga is approximately 14500 kilometers, much more than to Hawaii (about 9800 km), but still less than to New Zealand. For example, an AM station from Wellington more than 16000 km away has been logged in Finland. Tonga however is located much further north if you think of the true direction from Lapland, and therefore may require different reception conditions. A closer look at the time of reception may be helpful when planning other conquests in the Pacific. Theoretically it seems that Tonga and the surrounding countries could be audible even much earlier than 0930 UTC. In fact, sunset in Tonga in mid-November is already at 18.57 Tongan time, equal to 0557 UTC. Theoretically, again, this sounds very good as the entire path from Finland to Tonga is in darkness, as compared to 0930 UTC, when Lapland is already in daylight and the signal has to pass in sunlight for hundreds of kilometers. However, what makes 0930 UTC a much better time than the earlier hours is that around 0600 UTC signals from West Europe are still very strong and even with a directional antenna, it would be difficult to avoid European interference. On the contrary, at 0930-1030 UTC the sun shines over entire Europe and interfering signals are weaker than at any other time of the day - thus allowing the truly far-away and weak stations to be heard. Keep this in mind next winter - who knows what other island nations can be heard across the globe! And a wish for the future: It would be fantastic to actually visit Tonga, some day.